The year draws to an end and 2016 peeks around the corner. Yet new chocolate bars keep crossing my path. I was more than happy to discover the Michel Cluizel line in a gourmet supermarket in Brussels a while ago. Cluizel was definetly on my “to try” list. French chocolate makers know their trade. Together with François Pralus, Bonnat and Valrhona, Cluizel offers a wide range of chocolate bars and even more intersting, origin chocolate! The company started producing chocolate way back in 1948 as an expansion of their patisserie activities. 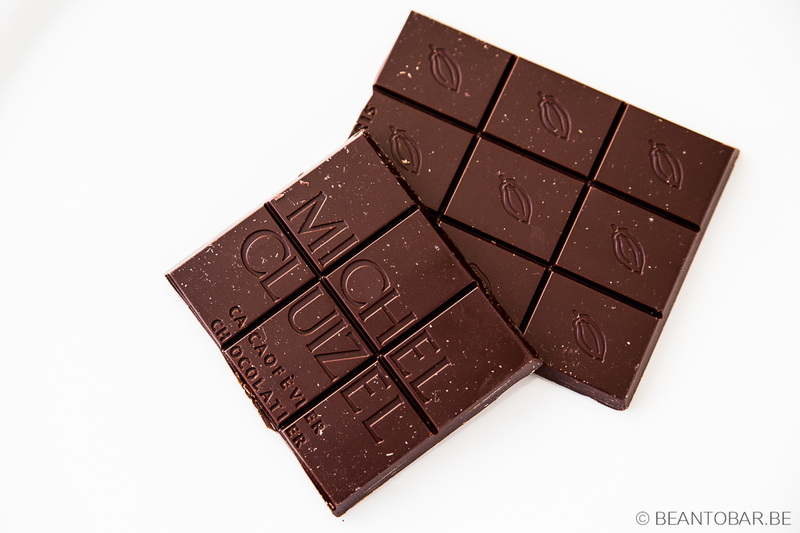 From the seventies on, Cluizel switched to making chocolate from the bean and by the mid nineties, the first origin bars emerged. Located in the beautiful Normandy region, Cluizel has an operation of over 200 employees, making them one of the bigger players. A quick visit on the address of the company on Google Earth definitely shows we are away from small scale experimentation. Today I review a Damville produced chocolate bar for the very first time. The package is a toned down from the earlier versions. A chocolate brown cardboard box shows a deep brown color. The island of madagascar can be seen on the background, while bright yellow lettering make it hard not to know which origin this is. Madagascar – Mangaro plantation. Research on the name learned me it is one of the biggest plantations in the Sambirano Valley, a renowned region in the fine chocolate world. Sadly, the package gives no clue on the type of cocoa used to produce this chocolate. The plantation grows Forastero, Trinitario and Criollo. Given the fairly low price of the bar, it is safe to assume we can rule out the Criollo type. On the back of the package, a small text situating the origin and the normal ingredient info. I was a bit shocked to discover vanilla as one of them. Normally this raises alarm bells in my head. Many industrial producers use vanilla to mask undesired flavors of low grade cocoa in their chocolate. Here we see the far more expensive bourbon vanilla pods being used, so for now we keep an open mind. The bar itself show the clear signs of a chocolate expert. Razor sharp lines can be found on the bar. 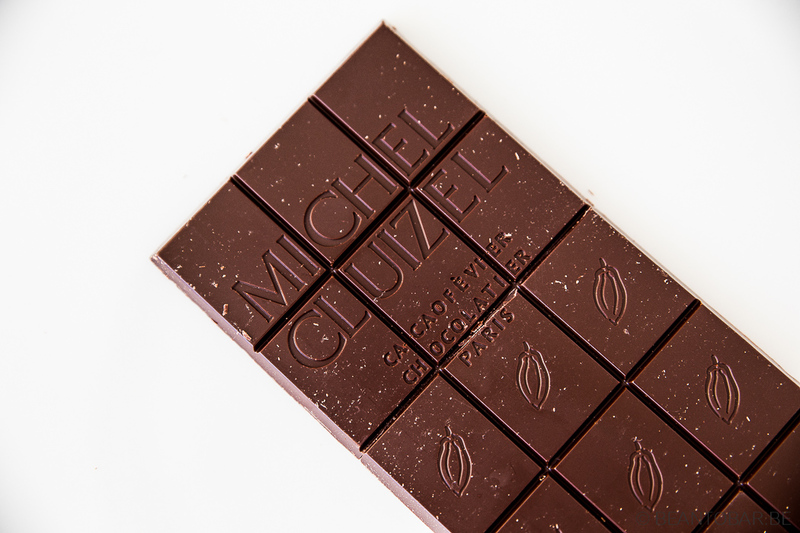 It is perfectly molded with a rectangular squares, the Michel Cluizel name prominent on top and delicate cocoa pods on the remaining pieces. The chocolate almost shines and looks gorgeous. Color: A nice dark brown. Aroma: Hints of hay, soft tobacco, slight spices and warm vanilla. Taste: The flavor sets of slowly with a splash of earthy tones, including a sight bitterness. 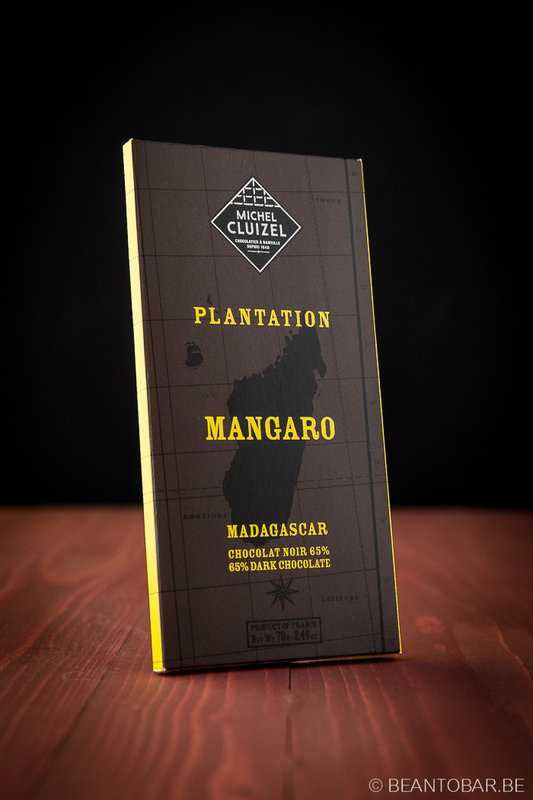 While these notes draw back, the typical Madagascan flavors storm the palate. Bright citrus fruits reveal themselves in abundance, with the spotlight clearly on lime and orange peel. While these stay very prominent on the palate, the earthy wood and espresso tones in the back offer support to keep the balance nicely even. Cluizel next throws in a dash of sweet brown sugar and luscious chocolate accents and sneak in a touch of cinnamon and clove, before the flavor finally evaporates with roasted hazelnuts filling the mouth. The aftertaste in a lot lighter in nature and offers a hint of cheese cake and earthy flavors and dark chocolate. It would be nice if the full bodied main flavor would persist longer and more vibrantly. The texture of this bar is almost perfect. It melts very smooth and evenly, with just a tad of filming in the mouth. When it comes to chocolate making, the French chefs remain unsurpassed in the texture department.But by doing so, I often feel they give up some of the bolder taste profiles. This particular chocolate bar is very satisfying in flavor, but aims for a well rounded, harmonious flavor experience. Making it perfect as an afternoon treat, without inviting you to sit down and really take your time to discover any hidden nuance of its flavor. But In the holiday season, it is perfect to share amongst your family and friends. You won’t hear anyone complain.